See more photos of our menu! Let us cater your next family gathering or business event! We have Appetizers, Soups, Salads, Sandwiches, Entrees, Desserts. Sit down to a hearty meal loaded with flavor! Take home several pounds of our specialty frozen meats! Give the gift of good food to family, friends & customers! Treat your guest to our custom catering! Sausage... A family tradition since 1961! You can always sit down to a delicious meal with us, but we also offer so much more! Take home our Prepared Specialty Foods & Meats to enjoy any time. 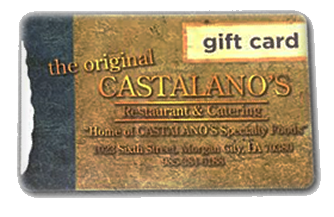 Treat someone special with a gift card! Show your support for our restaurant with a T-shirt or cap. Good Food...Perfect for all occasions.